I have a better idea = anyone who is stupid enough to vote Labour should be promptly boarded on a plane and air dropped into Saudi Arabia - parachutes optional. Fans of PM Gordon Brown? THE Treasury plans to rewrite Britain’s tax rules to usher in a new wave of Sharia law for the country’s financial system. The one-line revelation is buried in the 212-page pre-Budget report. It is among a string of startling details which barely merit a mention in Alistair Darling’s controversial mini-Budget – prompting fresh accusations that Labour is “burying bad news”. The Government wants to tap into the fast-growing Sharia finance market, set to top £205billion a year, and turn London into the “global gateway for Islamic finance”. Many conventional financial products are not Sharia compliant because Muslim clerics view conventional loans, which involve interest payments, as sinful. The UK Government was one of the first Western countries to issue a state-backed sukuk, an Islamic bond. It now wants to rewrite tax laws to stop Muslim businessmen being unfairly taxed when they try to raise money on their companies. Conventional loans allow them to take equity out of their business, using the property as collateral, but to be Sharia compliant a Muslim “sells” the business to the bank and then rents it back. That leaves the businessman facing a bill for capital gains tax and the Treasury wants to level the tax playing field. Mohammed Amin, head of Islamic finance at PricewaterhouseCoopers, said: “The UK has become the leading Western country in Islamic finance by taking a series of measures to ensure that Islamic finance is taxed no worse and no better than conventional finance. “The pre-Budget report continues this progress by including measures to equalise the tax treatment of property refinancing transactions.” Ministers are also considering issuing Government bonds to Islamic banks to help them comply with new financial regulations. With three independent Islamic banks and high street names at the forefront of compliant accounts, London is one of the world’s largest centres for Islamic finance. Sharia-compliant mortgages, car insurance and even baby bonds are available for Muslims wanting to avoid “riba” – interest payments. Supporters say the Government is wisely getting in on the ground floor of a market which could net the City billions in the future. Critics warn Labour is rushing into a financial system it does not fully understand and question how far laws should be rewritten to accommodate Islamic practices. The Financial Services Authority says its policy is one of “no obstacles, no special favours” for Islamic finance. Last week’s pre-Budget report includes the revelation that bankers will still net £4.5billion in bonuses this year despite the so-called super-tax on the City. Ministers also used the cover of the report to admit the Homeowner Mortgage Support Scheme, permitting deferment of interest payments, has been an abject failure. Too gobsmacked for too many comments - trying to keep my head from exploding --- you truly couldn't make this crap up! 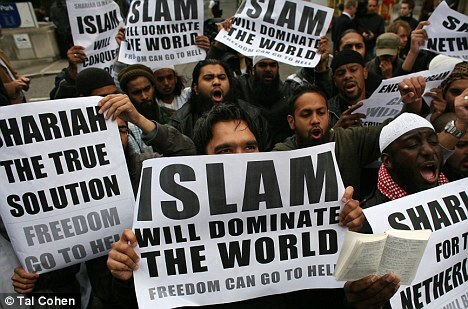 Bank dhimmis think the British people will put up with this? Time to withdraw your money and boycott Lloyds but make sure you check to see if any other banks are conducting this Sharia Law based anti-muslim discrimination. Many Lloyds TSB customers are being hit with charges of up £200 a month if they go into the red - while Muslims who use the bank are only being charged £15. If a Muslim customer who has insufficient funds in the account tries to make a payment, it is blocked and a 'return item fee' is charged. However, on some Islamic accounts such a payment is authorised and an 'unplanned overdraft fee' of £15 is then levied. Meanwhile, customers with standard current accounts who go into the red by at least £100 without authorisation are hit with an 'unplanned overdraft fee' of £20 a day for a maximum of ten days. This could mean a customer has to pay £200 in one month. The Islamic account is available to all customers at Lloyds TSB. In theory, anyone who does not need a permanent overdraft facility could switch to this account to avoid being hit by interest charges for going into the red. The disparity between the two accounts emerged after the bank sent its customers a booklet this month explaining its charges. Graham Milne, a customer and chartered accountant from Norham, Northumberland, said difference in fees was tantamount to 'religious discrimination'. He added: 'This means that all the non-Islamic account holders are subsidising those with such an account. It strikes me as something which is bordering on illegal. 'One cannot help feeling the organisation is bending over backwards to help Muslims to the detriment of everybody else. In the past few years, millions of customers at all the major high street banks have demanded the return of money which has been taken from their account in various forms of bank charges. Many got their money, or the majority of it, back. A test case - designed to rule if such charges are illegal - is going through the House of Lords. Until it is resolved, the subject continues to remain hotly contested. A Lloyds TSB spokesman said: 'The Islamic current account is for customers who cannot receive credit or debit interest due to their religious beliefs. 'All of our Islamic accounts comply with Islamic law and are available to anyone regardless of background or faith. Earlier this month, it emerged that losses at Lloyds had escalated to £13.4billion - largely due to the reckless lending of Halifax Bank of Scotland, which it bought for £9.6billion in January. Is Britain Facing A Summer of Discontent & Rage? Is the USA far behind? We can recall the time of Britain's "Winter of Discontent" but is Britain facing a similar period - that could spell a Summer of Discontent? It appears law enforcement fear and are preparing for a "summer of rage". "Police are preparing for a "summer of rage" as victims of the economic downturn take to the streets to demonstrate against financial institutions, the Guardian has learned. Britain's most senior police officer with responsibility for public order raised the spectre of a return of the riots of the 1980s, with people who have lost their jobs, homes or savings becoming "footsoldiers" in a wave of potentially violent mass protests." Is it any wonder when British people, under the inept Labour Government, are facing the worst economic times since World War II - others say it is the worst recession in over 100 years? Yet the Labour/EU government continues on the path of rampant unfettered immigration and favouring immigrants over the indigenous British people in the face of ever shrinking available jobs. There is evidence that the United States new Messiah-President also has concerns about bad populous reactions to dour economic times, his recent policies and to the congress passed trillion dollar economic stimulus (pork-ulous) bill and escalating bank bailouts . Many Americans feel that the current mortgage meltdown was caused by the government and ACORN type groups forcing banks to make risky loans to low income borrowers - often minorities - living in unstable neighborhood. Now former community organizer, Barack Obama, has set forth a plan -forcing taxpayers to take the "hit" and bailout these same "risky" mortgagors who face foreclosure and/or owe more than the current house value. (For an excellent video on this where Brit Stuart Varney takes on head of ACORN go HERE) This plan is growing more unpopular by the day. The citizen anger against this outrageous Obama decree is perfectly stated by Rick Santelli of CNBC -will also stir the pot of civil unrest. Could this be why the Army National Guard recently planned - and later scrapped due to citizen outcries- a training invasion of a small town? Or why the US Congress has a new bill, H.R. 645, submitted calling for the secretary of homeland security to establish no fewer than six national emergency centers for corralling civilians on military installations? Clearly British and American leaders are concerned about a populous revolt. I'm not an econonomist but I am a taxpayer and I - like so many other "average" people - am fed up with paying for others mistakes and downright angry - the only real question is WILL WE WAIT FOR SUMMER?